Nothing like a bit of UK chart perusing for these cold winter nights. Here are some dance music hit singles that made their first chart appearance 30 years ago, in the month of January 1989 - also known as the month Kylie & Jason ruled the charts. "Black is the word." The Rok Da House rappers hit the charts on New Year's Day with Born This Way and rose to number 23. The title was later copied by Lady Gaga and by the cast of Glee. Todd Terry's the chap who turned Everything But The Girl into a dancefloor hit. Here he is in 1989 tearing up the dancefloor and the chart, scoring the second of two top 40 hits under this particular alias. 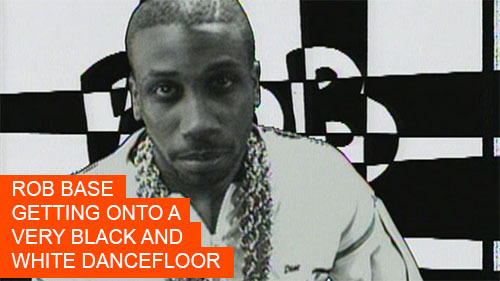 Although It Takes Two was Rob Base and E-Z's signature song, Get On The Dance Floor was the bigger chart hit, entering at number 30 on 8th January 1989 and peaking at number 14, a couple of places above Milli Vanilli. I must admit, I don't remember this one, even though it uses as its beat the "In My House" breakdown on the Pet Shop Boy's remixed Always On My Mind. Anyway, there it is, scoring a tiny number 52 hit in the middle of January 1989. This veteran Chicago house producer reached number 47 with this double a-side at the end of January 1989. It should have been a bigger hit, with all that lovely acid.